Even when we’re crazily busy, we still have to eat something. Why not treat ourselves a delicious chocolate cake even though we feel like no time to make any? 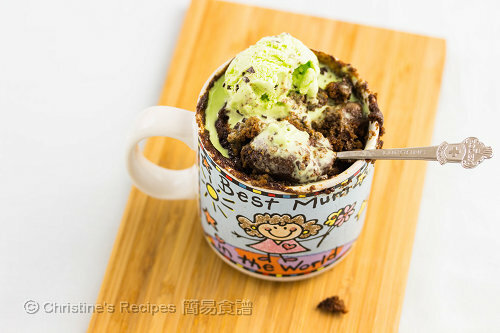 This mug cake might serve you well in just 90 seconds. Oh, remember to use a large deep mug if you’d like to give this recipe a go. The cake will rise quite high in the mug. Or else you have to spend extra time to clean up your microwave oven. That’ll end up with more than one and half minutes to enjoy this cake. 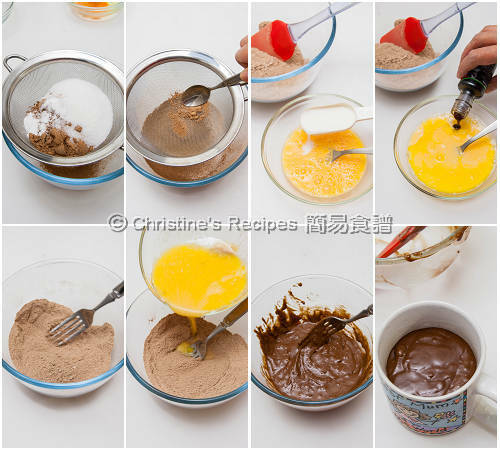 In a large mixing bowl, mix plain flour, instant coffee powder, cocoa powder, baking powder, castor sugar and salt. Set aside. Use another mixing bowl. Whisk the egg. Add in milk, vanilla extract and the melted butter. Lightly incorporate the flour mixture with a fork. Don’t ever over beat the batter. Just combine all the ingredients. Pour into a mug. Cook in a microwave oven on high for about 1½ minutes. Done. Serve with mint chocolate if you like. Very yummy indeed. Make sure to use a microwave oven friendly mug. The power of every microwave oven is very different. The cooking time needed might be different from the time suggested in this recipe. The amount of sugar can be adjusted to your liking. If the mug cake is served on its own without any ice-cream, add some more sugar then. By using mixing bowls, it’s much easier to combine well without any fuss. For convenience, you may combine all the ingredients in the mug. If you want to bake this cake in an oven, feel free to experiment the optimal oven temperature and time. 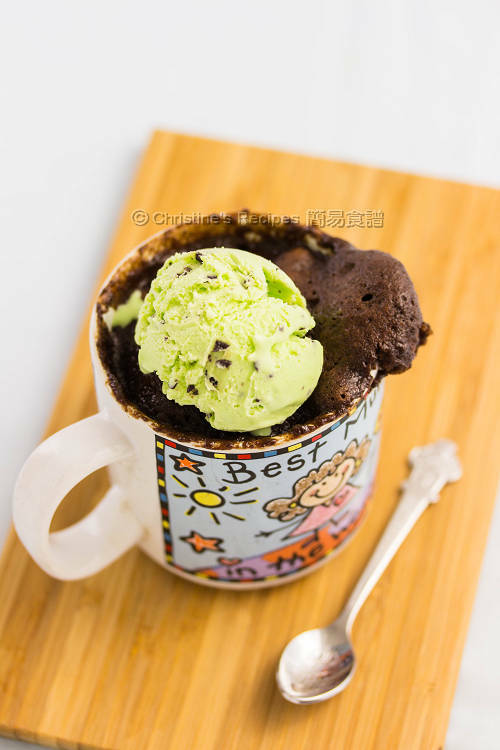 Here’s a post previously on experimenting different methods of making a mug cake. hi Christine I only use microwave oven to heat food, not cooking. Please let me know how to cook this in a normal oven. thanks. Suppose you bake the cake in a muffin pan. Bake for 15-20 minutes or so at 180C. That looks so GOOD with ice cream! I didn't have cocoa powder or instant coffee, so I experimented by adding a spoonful of chocolate breakfast spread last before microwaving. I think the lack of the two powders resulted in a wetter cake? The result was more like a self saucing pudding. Which was a pleasant surprise. Good on you. Thanks for sharing your pleasant surprise. Nice and moist, replacing the cocoa powder with actual dark chocolate also works (about 6-8 squares).